1)Prepare a steaming tin. (I used a mini loaf pan of size Length 17.5cm by Width 7.5cm). 2)Apply oil on all sides and bottom of the pan. Lay a piece of aluminium foil ~ (U shape) on the bottom and 2　long sides with 2 end protruding out. (foil matte surface sticking on the pan, shining surface facing up.) Apply oil on to the aluminium foil surface too. 4) Whisk corn starch and milk together. 6) lay the salted and century egg into pan, distribute randomly. 7) Pour in the egg mixture thru a strainer. 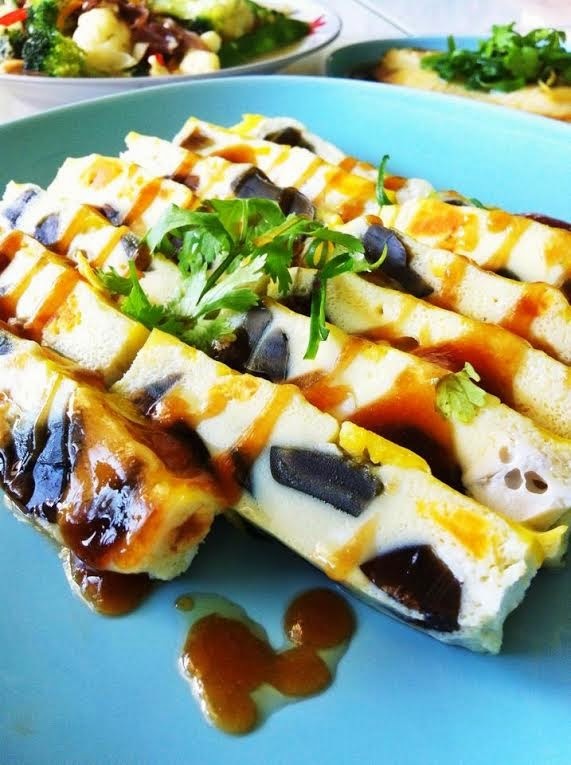 8) Make sure egg mixture cover all the salted and century egg. 9) Bring to steam for around 4-5 mins till top layer is set. 10) Remove the wok cover, pour in the 2 eggs yolk mixture on the top surface. turn to low heat continue to steam with lid covered for 4-5 mins. 11) Tilt the lid (90% covered) to let the steam escape so as not to create too much water vapour inside, to continue stem for another 4-5 mins. This is to prevent water droplet drop to the egg surface and may deteriorate its top surface finishing. 12) Take out after the egg is set. Let it cool for 10 mins. 13) Carefully run a knife at the pan surface and use the 2 end of the aluminium foil to leave up the egg. 14) The set egg should be around 2 to 2.5 cm thickness. 15) Trim the end and cut to desire size. It should give a (terrazzo effect look) Serve with sweetened oyster sauce or thickened sweet soy sauce. 16) this steam egg can also be served chill with preserved ginger.